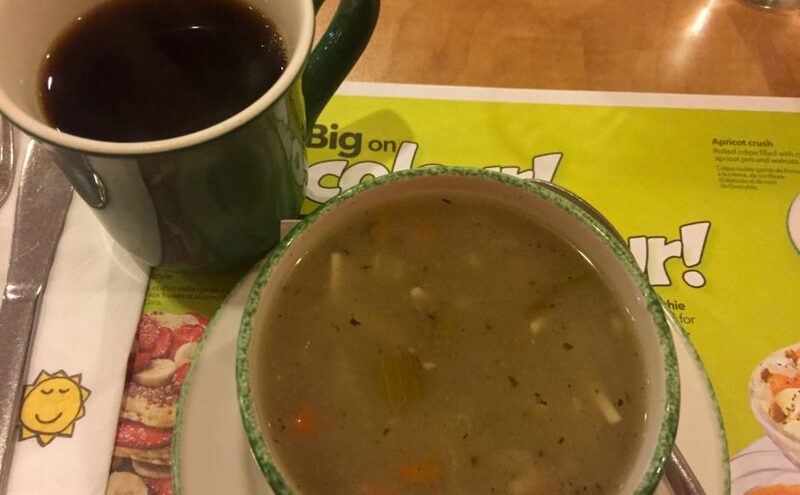 A steaming cup of coffee and a bowl of homemade chicken noodle soup. Does it get any better? It’s a miserable grey day, there’s a steady drizzle making everything shiver and people hide inside. I stayed in my office most of the day, kept the lights off, just the glow of my mom’s lamp (I finally remembered to take it there) and the hum of my computer. But my tummy started growling, so out I ventured into the dismal day in search of food. I found myself at Cora’s, an amazing little restaurant. I didn’t dress properly for the chilly day so I was grateful for the coffee cup to warm my hands. When my food arrived I realized how lucky I am to know the creature comforts we all crave. To have the privilege of stature in our world and most days not consider those comforts as privilege. Many in this life are cold, hungry, alone, starving for the life we take for granted. So today, for those few moments, I found thanks in my privilege….and my chicken noodle soup.